Stems: Decumbent to ascending, few to many, sometimes branched, frequently reddish, appressed-hairy. Leaves: Alternate, simple, stalked or uppermost sessile, numerous, oblanceolate to elliptic-lanceolate, 2 to 6 inches long, .25 to 1.5 inches wide, thick, leathery, green, young leaves and buds grayish, appressed-hairy; margins entire or shallowly toothed; tips pointed or rounded; mature buds usually erect. Inflorescences: Solitary flowers, in leaf axils. Flowers: Showy, 3 to 6 inches wide, floral tubes 2 to 6 inches long; sepals 4, linear-lanceolate to lanceolate, bending abruptly downward and toward 1 side, often purple-spotted; petals 4, 1 to 2 inches long, nearly as wide, yellow, fading reddish or orange; stamens 8, filaments nearly as long as petals; stigma deeply 4-lobed, cross-shaped. Fruits: Capsules, 1.5 to 4 inches long, conspicuously 4-winged; seeds numerous, small, angular, corky. Habitat: Dry rocky prairies, limestone hillsides, road-cuts, and disturbed areas. Comments: The flowers open near sunset and close by mid-morning of the following day. Night-flying moths pollinate the flowers, which face upward at first, and then turn downward after pollination. 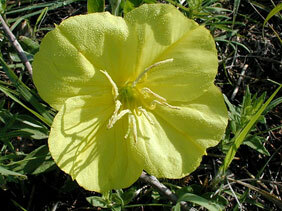 Missouri evening primrose is drought-resistant. Three other subspecies of Oenothera macrocarpa occur in Kansas.